During World War Two Hamilton dedicated production to US military purposes and the war effort. 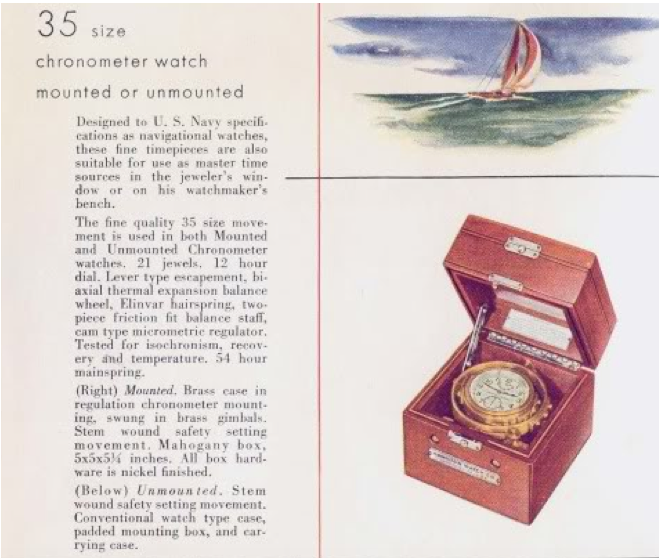 This included wrist watches for military personnel as well as specialized timers for precision bombing runs. Hamilton also produced clocks for aircraft. 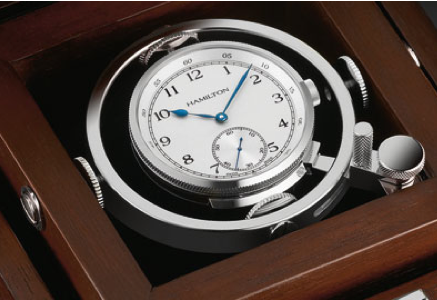 And finally, Hamilton produced highly precise chronometers for the US Navy, Army and our allies. One of these chronometers was called the Model 22. So the first thing to point out on this watch (often referred to as a deck watch) is it's large size. 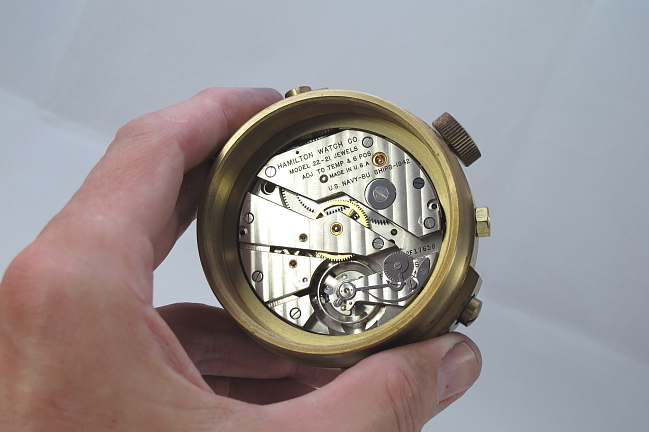 It's a 35 Size and about 70mm in diameter at the main plate of the movement. 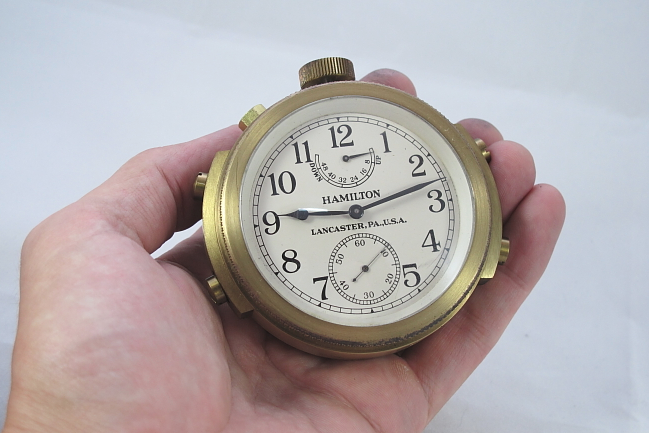 The largest pocket watch Hamilton made was an 18 Size, so this is a very sizable time piece. It's presented often in a gimbaled box, although you will also see it in a stainless steel pocket watch-like form (I think that might be the Army version). 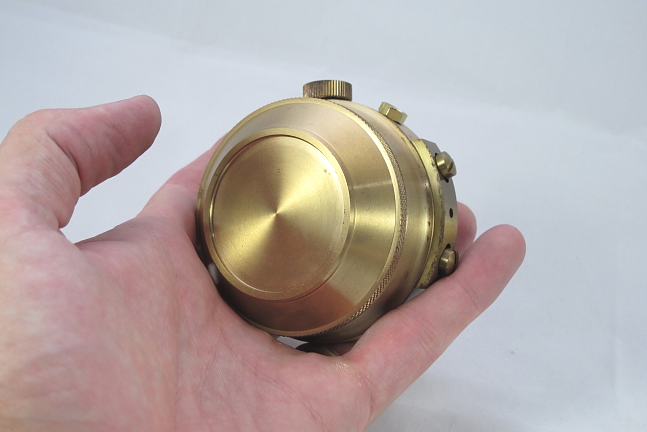 The brass case on the gimbaled version is very heavy and the design is such that the dial always faces up - thus eliminating a cause for timing variation. Regardless of the boxes relative position, the dial always faces up. Hamilton also made a Model 21 chronometer... about the same size but with 14 jewels instead of 21 and incorporated a fusee design. I find the 1940 ad above interesting in that it refers to a 21 jewel design (ie Model 22) but also key wound and key set (Model 21) so I'm not sure which model this ad applied to. I used to be a US Naval Engineering Duty Officer, EDO, and today EDO's work for the Naval Sea Systems Command (NAVSEA) and support the fleet in various capacities (shipyards, etc.). Back in the day, NAVSEA was called the Bureau of Ships, or BUSHIPS for short. So I find any Hamilton time pieces with BUSHIPS on them to be particularly of interest. 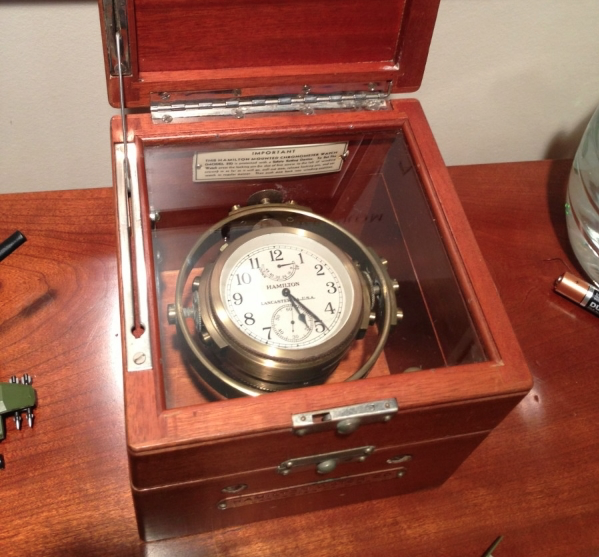 Here's a photo of my Model 22 Gimbaled Chronometer (without a box). Note the size of it relative to my hand (which is actually pretty large as well). The sub-dial below the hour and minute hands is the seconds. The sub-dial above the hands is the mainspring tension - or how wound up the watch is. Like a fuel tank indicator, the little hand will move from right to left as the 60 hours of run time are elapsed. In the photo above, the watch is wound with the large knob (crown) on top of the 12. Next to the 11 is a pin that you push in so that you can pull up the crown and set the watch to the appropriate time. The other four protrusions on the sides of the watch are screws for mounting the watch in the gimbaled box. All movements are marked US Navy BU SHIPS and the year they were made - even the ones that saw service with the Army. At least half of the extreme weight of this watch is derived from the solid brass cover that encloses the movement. And here it is installed in its gimbaled box. There is another, larger, box that this box would go into. To celebrate Hamilton's 120th birthday, the company has introduced a special wrist watch called the Hamilton Navy Pioneer Limited Edition. It comes with it's own gimbaled box - but it can also be worn on the wrist! Of course, at 46mm in diameter, it would take a manly man to effectively pull off wearing a watch this large. Of course, if you want one (and I do) you'll have to dig deep as they run about $3,000! So, I'm afraid I won't be getting one. 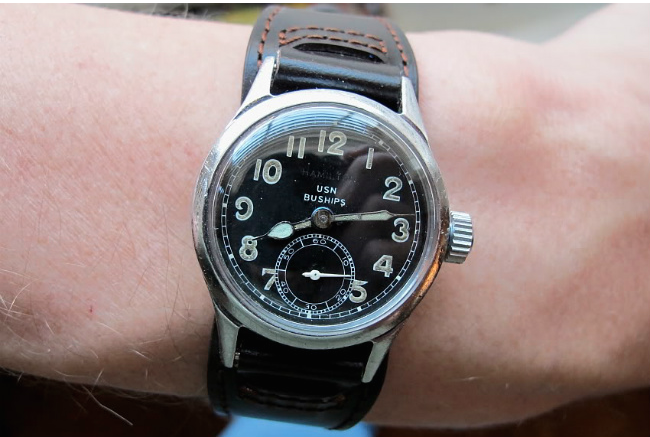 But, since I'm on the subject of Hamilton BUSHIP military watches, check out this WWII-era US Navy watch. You can just make out Hamilton in black above the USN logo. I have several military watches but I'll save that for a future post.